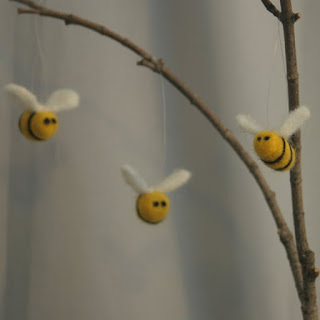 These bees were needlefelted for a woman who had a custom request on Etsy. She wanted one-inch bees with white wings. I've never made them so small, and they came out really cute. My friend in Maine sent me a blog she thought I'd like - The Frugal Girl - and I really do! Here's a link: www.thefrugalgirl.com. I'm looking forward to reading her blog regularly. It's frigid here. I hope you have a warm place to be today!